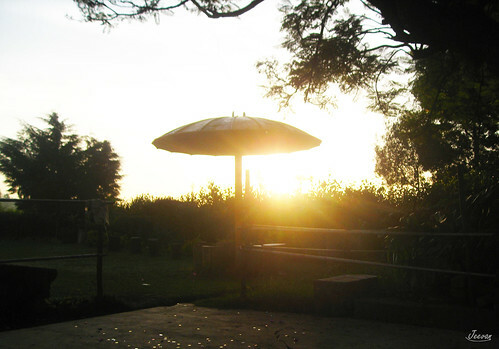 The garden city is the nickname of Bangalore which has many gardens to derive its names from. I have come across Bangalore couple of time but only now got a chance to stay over and discover the places those are familiar with names of garden. One of our friends, who come to know and become familiar via blog, had invited us to her home in Bangalore. The plan has been on consider for very long time and only get approved by us now, so leaving to Bangalore tomorrow with a list of places to visit and take rest in the presence of much better and very pleasant weather unlike Chennai, and moreover it’s the warmth and care wanted us to stay at her place. 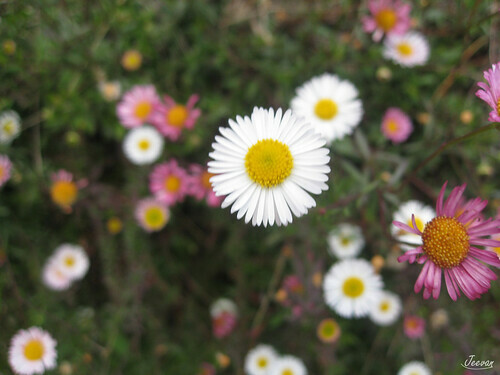 Here I come up with few pictures captured from the Botanical Garden in Ooty, from our latter visit. 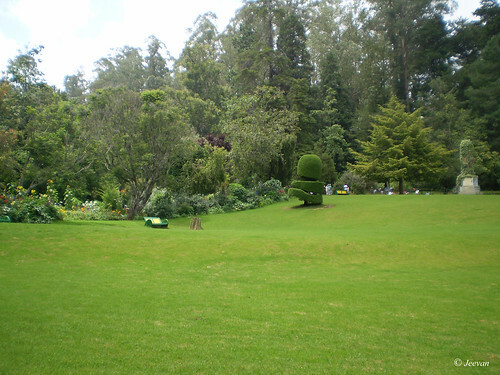 The Fern House (above pic) in the Ooty Botanical Garden is home to many ferns and orchids. Established in 1894, this house is dedicated to W.C. Mc. Ivor, in whose response the Garden has been developed to this stage from the then a patch of vegetable garden and wilderness of Shola and shrubs and the lower part as a swamp traversed by deep ravines. 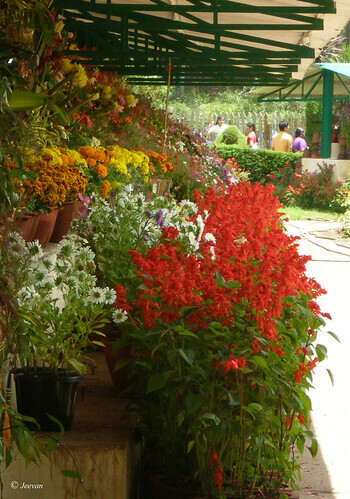 Display of flowers : Ooty, famous for its annual flower show had begun recently in the botanical garden, with varieties of roses and flowering plants at display, and creation of sculptures using colorful flowers. Keeping in mind of India won the World Cup in cricket, a floral replica had been created which expected to attract more visitors this year. 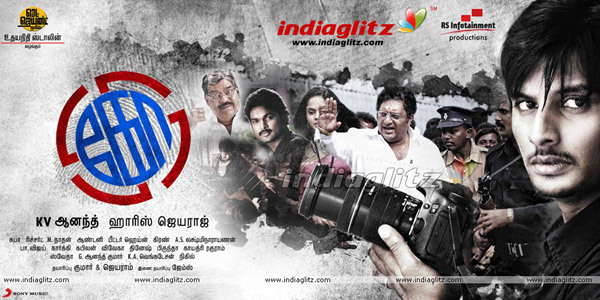 Being a cinematographer himself has taken the photo journalism as the plot for his movie KO; K.V. Anand had directed a superb movie where I could see similar thoughts and dreams take stage on screen. As a believer in young people could change anything, with their tireless, energetic and exuberant I could follow my dream until the climax where things change with intend to end the story. Many scenes reflect what is in my mind and the camera played an important role rolling parallel to the fast track screenplay and discloses the media’s interface in bringing change in society. As a photo journalist, Jeeva had a wonderful opportunity to play an ever powerful role as a smart hero with an introduction by chasing a tempo traveler to shoot the photos of the bank robbers and further blocking their progress, was a fantastic action scene could easily challenge the Hollywood. I think there couldn’t be a perfect time to release the movie which revolves around the media and politics what played a revolution recently in the rule of TN. The media had been portrait well and its importance and risk involved in collecting news and producing the result give an idea how things happen. Ajmal in a young leader character who want to bring change into politics resemble how someone would be in near future if youngsters enter politics and rule the govt. Not to forget the two sweet and cute heroines, Piaa and Karthika – the daughter of latter heroin Ratha, wasn’t just pretty, but exhibits really good expressions to be real in acting and cheerful in songs. The Piaa was as sweet as pie and best suited for a girlfriend character that anyone would like to have one alike her. A movie from a cinematographer turn director doesn’t need a thing to say about how picturization would be, it was fantastic and outstanding. The song related sequence and actions are excellent and capturing exotic locations esp. the places around the cliff of Prekestolen of Norway for songs are fabulous and treat for eyes. To say about songs and music, it’s rare to come across a whole album which quite delights and to become all my favorites. To watch a decent political related feature and to experience the worth of delight in photography, KO is recommended. The title slides resemble the flicker stream! I watched the movie yesterday at a night show in Drive-In. Leaving home in Chennai at 7 in morning and reaching Kotagiri about 8 at night, the whole day went on traveling via en route Dharmapuri, Mettur, Sathyamangalam... it was partially wonderful as we travelled half the way through state highways which are my favorite routes that goes through small towns and villages. We stopped at Mettur Dam to have our fish fries for lunch and the home we know through our past visit treated us with fish fires identifying our latter visit. 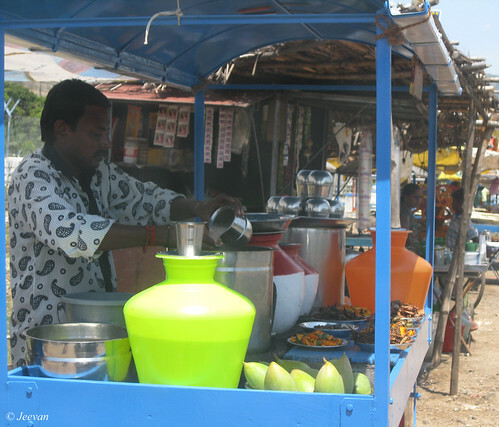 While the fish fries get prepared; we explored the nearby shops by buying sweet corns, murukku, color candies… and the mobile vendor who selling porridge got lot of attention from people and being a hot summer day cousin’s chose to have it. We moved further from there and stopped for our lunch break under a shadow tree and after sometime leave to Sathy in search of rooms as we had book for only 3 days in Kotagiri and wanted to stay in Sathy and go to Bhavanisagar and Bannari temple, but we couldn’t get any rooms in ground floor so called the Belair cottages in Kotagiri and they were glad to advance a day in our booking and we went directly. From Sathy to Mettupalayam, it was a wonderful evening time passing through the winding roads and Eastern Ghats followed by the Western are very pleasant while the sun settle down with different shades and shapes of clouds at various moment. 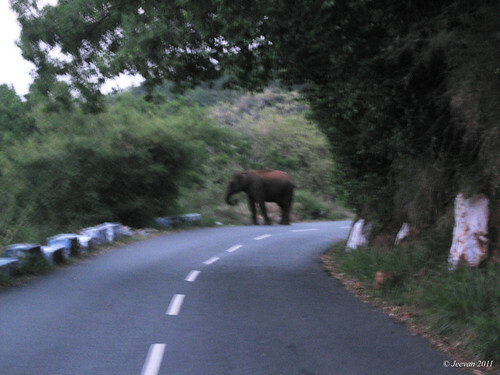 After reaching Mettupalayam we took the Kotagiri road directly without going through Coonoor and the adventure begins here as we passed through the forest road that bears the warning signs of elephant crossing. As we were looking for something interesting, a wild elephant come into our way and it wasn’t hindering but standing beside the road eating bamboo leaves and leaving the dung on the road as a sign of exist. We didn’t expect an elephant to be standing on a bend and we managed to pass him without fear unlike either vehicles standing on road to let him move and the thrilling part was when a guy suddenly tries to turn his car in scare of seeing an elephant interrupted our path with elephant behind. Parents and the drive come cousin whose fear about wild animals got little tension over this and I and other cousins who were expecting something like this – I mean the elephant, were excite more seeing a wild elephant. The cold increases in atmosphere as our elevation rise, we had our coffee at a roadside shop near a small village, where a Toda festival was going on and the speakers were singing aloud a Badaga song which we couldn’t understand anything but my cousin identified it was Badaga as he’d studied a year in St. Jude’s public school, Kotagiri. The adventure doesn’t stop and it continued this time in form of mist and it was enormous to quite hide the road for a while nearing Kotagiri and nothing could be seen opposite except a gray screen. We stopped somewhere to let it clear, but it never seems to be so we moved slowly following the road studs laid on the center of the road. Even it is difficult to dive in mist I feel wonderful moving into enormous mist and cloud that last for nearly an hour, sitting next to diver seat. It was very cold and lightning crosses the sky with thunder when we reached Kotagiri and things become normal soon and we felt very comfort at the Belair cottage. We were allotted to stay at the main building built in British period which is at ground level with couple of steps was very easy for my wheels to get in and the new blocks were at elevation. The people at Belair are friendly and lean any help and in order base they provide lunch, dinner and breakfast and on the opening night we had chappathi-kuruma. The preparations and serving are made by Manipur guys. What disturb me more than I was were the rising vehicles, pollution and population of people in India. We all know it doesn’t take place in India alone and everywhere it cause an effect, but unlike ever it causing much trouble because of its never ending progress of increasing concern. I wonder where we are going uncontrollable on the road which no one knows where it would leads so and the environment we are creating today and for tomorrow is to stay cool inside the home or vehicle to switch on the air conditioned wind to inhale than going out breathing fresh air. In cities, bikes has turned less than owning a car’s intention being raised took away every space to play as parking and owning two to three vehicles per home increased incredibly traffic on road and more than driving into the city it’s becoming easy driving far away from the crowd. The pollution has become slow poison to city dwellers and breathing fresh air has become a rare occurrence in cities except less space for parks and beaches where people gather a lot to exercise their breathe, but where to go when everyone need there space to breath. The weather is becoming hot everyday and climate has been changing day by day but the cause to reduce these has becoming a mirage every time leaders gather to debate on conferences to end without a confidence to defeat. The income of the people has been increasing phenomenally when even recession and inflation has taken place the people hadn’t took much care outside their homes where the actual cause began or needed to be tackled down. The replacement and building constructions has been taking place everywhere and often into the city, the debris and dust has been sent into the living space and spread into the homes and dishes that we eat into infections and disease. I had the worst day out into the city, moving in the traffic and the black smoking silencers and the noise has threaten me with caught and headache, even we were partially enclosed in vehicle I wonder what trouble the bike riders and pedestrians could suffer from. It’s incredibly worse what the way we are living by just reducing our life time to these strong odors, chemicals and in name of sufficient and carrying our family we disturbing the civilian society which includes one of us. We could seek justice for everything and things happens in need and taking steps further increasing our status and none could deny it, but when things goes out of control or concern we are responsible for our future and upcoming generation. Everyone’s wish and concur comes closer or in line sometime to experience what others appreciate in life and there’s nothing wrong in it and we need to work with concern and sense. Just wrote what I feel and thought about something that exists and come across in mind. The ferocious summer heat is back here with never before fierce to make sure we suffer from its violent rays and struggle to beat it in various ways but still the construction of heat has been going strong unlike before. The Chitirai, the Tamil month that marks the begin of summer bears the period called Agni Natchathiram, which means ferocious summer heat that last for 21 days sharing the Tamil months Chitirai and Vaigasi on calendar. No one could say how intense it could be in coming days, but sure it going to be same or more unless a low pressure happens of either sea’s of Indian Ocean or the beginning of southwest monsoon which we all wish for. Whether we call it by any name, the world is become warmer day by day and a part of its reflection is what we experience in this summer season and the increase in using refrigerators and air conditioners can give a temporary state of comfort and cooling but they are preparing our earth to a intensify state of warm outside our home. Chennai has been measured the highest degree in temperature across the state, which is 105 today and most of the cities in Tamil Nadu had scored more than a century. When the news flashes the beginning of rage summer heat in state, happily many part of it had witnessed storm rain and Kotagiri which we visited last week had high rainfall of 90mm. To our great disappointment, most of the places we came across last week with intense heat had gone cool over night due to sudden rainfalls had enthralled us. The disappearance of clouds had given hand to the blue sky to flash direct sunlight on our poor people who were mostly scare about summer heat had began to frighten more than ever thinking about the skin disease had made distract more easily. The showers that where hot without heaters and the clothes get wither so easier in the heat waves could be grace, but the chart of cutoff current across the state esp. at the midday had been worst than anything. I myself being an open window delight couldn’t stop agree closing the doors to only open in evening for the sea breeze to take off which usually take place after noon had been delayed these day. 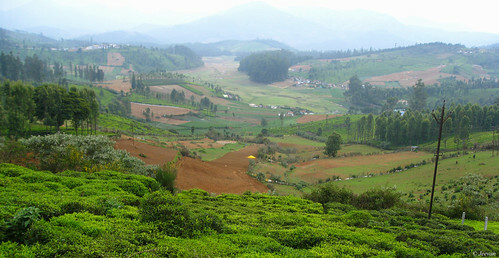 Last week I was in Nilgiris (Blue Mountains) for a week vacation and stayed in Kotagiri with parents and cousins. It was a wonderful journey traveled across the Blue Mountains carried by enormous mist, twittering sparrows and fun floating amid cousins and the space for breathing fresh breeze off valleys and mountains are fabulous. Couldn’t still come out of the sights and scenes that carried on mind and memories still inhale the fresh breeze of Blue Mountains, which are greener and sandstones taking place. Traveled on paths that have never been or even imagined and checking the innermost nature as it is through mind, sense and images are a greater opportunity I got through this travel. 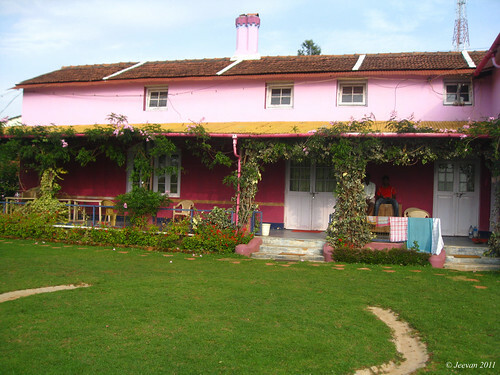 It was well comfort and pleasant stable at Kotagiri for 5 days and 4 nights in the Belair cottages surrounded by somewhat tea plants and green lawn are best at leisure. 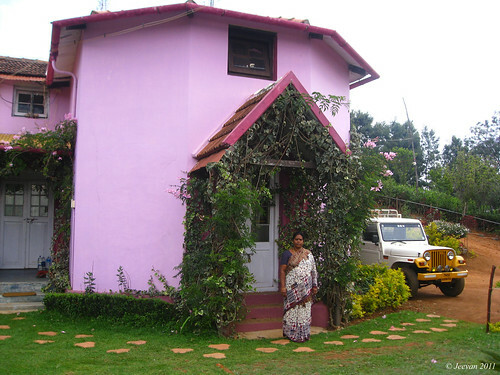 The intend of this travel was to visit avalanche and to stay in the forest rest house for at least a night, but I couldn’t get the chance as it was booked for nearly 2 month, we just checked in and out getting permission from forest office in Ooty. It was an awesome ride into the dense forest of Avalanche and Upper Bhavani, and the whole ride was among road-less with either sides of shoals and grasslands. I decided not to release any pictures that captured inside the prohibited area as it is worth to be protected from outside world knowing that it could attract anyone easily to be disturbed and I never know that I need to travel through this thick forest to check upper bhavani backwaters. Throughout the way it was astonishing climate and weather and was splendid beautiful. There was an excitement carried on within everyone as there was no man’s activity along the way and it was quite silent except for twitter birds and streams and falls noise. 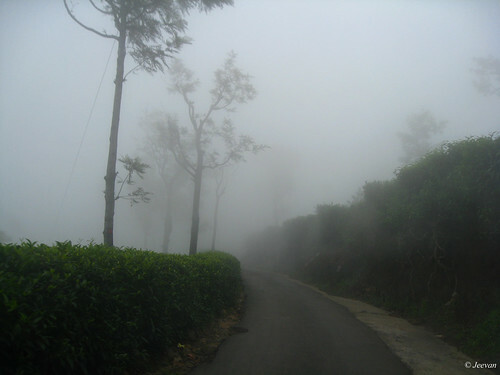 Most of the travel happens between Coonoor-Kotagiri and Kotagiri-Ooty as the places we wanted to check were laid on northwest we touched either city to connect the roads and was suppose to be tire hold to the many curves. Partially it was a successful and dream come true travel, but still I hang for these places to be revisited and wanted to go beyond these place next time. Thanks to the Scorpio and its tubeless tires, and excellent driver come cousin and without them it’s hard to move into this off-road terrain in and around avalanche towards upper bhavani.